I love farmer's markets. I love the fresh air, the fresh produce, the creative crafts, the delicious desserts, and if you are lucky there might just be a great band playing. We are lucky in our hometown to have a weekly market all year, on our awesome, revamped boulevard. It's also a great place to go and people-watch, or dog-watch since lots of pooches make it out too. I like trying new things too and the farmer's market is full of them. The market here has these AMAZING lemon flavored pita chips with hummus, potent but delicious. Sometimes a new ingredient can take my cooking from humdrum to hip! 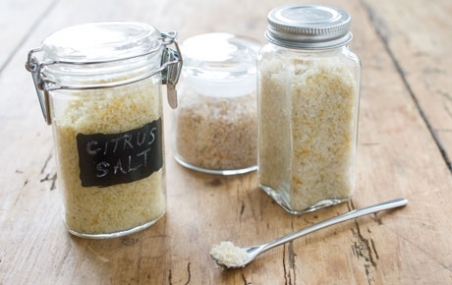 One of those humdrum solutions that can be found at the Farmer's market is flavored salt. Sometimes these flavored salts are referred to as finishing salt. It comes in many different flavors and it is something you can definitely get creative with food wise. Flavored salts can include spices, herbs, citrus, mushroom, really the flavors are very vast. I have heard of vanilla salt, chipotle salt, orange rosemary salt, and many others. These salts are great for use in cooking and have a salt base of either sea salt or kosher salt. (Kosher is usually cheaper). If you don't have a year round market, here is a cheat for you to make it yourself, great for adding to a roast chicken or fish. This might also be a great gift for a foodie friend! What are your favorite farmer's market finds? An interesting way to liven up your dishes! Preheat oven to 200 degrees F. Add the zest and salt to a medium bowl, then pour in the lemon juice. Stir until everything is well combined (salt is coated with lemon juice). Line a baking sheet/pan with parchment paper. Pour the salt mixture evenly onto lined pan. Slide into the oven and bake until zest is thoroughly dried (about 2 hours). While mixture is baking, give it a good stir a couple of times to make sure that everything dries evenly. Remove from oven and let cool. Pour into a sealable jar.